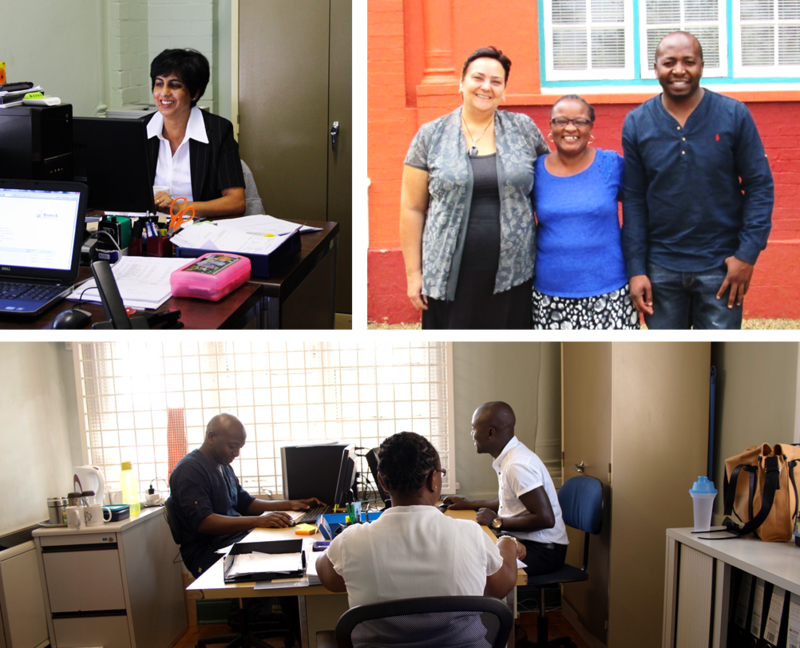 As for every company, also for inqaba biotec it is crucial having a professional, efficient and well-organized administration team. Obviously, the bigger a company gets, the more complicated and challenging this part becomes and it is important that all the people involved, act together, perform their part accurately and make sure to keep the perfect order. At inqaba biotec, we have a good mix of well-experienced, young and enthusiastic team members. The person that has run the admin office from the launch of the company on is Vani. Back then Vani was one of 4 employees and worked as secretary. She was responsible for the secretarial work as well as basic accounting, product shipping and invoicing. Today Vani’s job is called admin manager and she ensures that all orders are processed, invoices are done and sent to logistics and that all payments to the creditors are performed. Furthermore, she is responsible for processing and paying salaries and overlooks all the departments, when Dr. Preisig is away. Before her time at inqaba biotec she was a dental nurse at a hospital in KwaZuluNatal and moved to Pretoria in 1991. She performed a basic accounting course, the pastel course and a “financial course for non-financial managers” in order to excel at her present position. Vani said that she loves her job and finds it pleasure getting up in the morning and coming to work. She is one of the few people in the world that are not on facebook. The second person from the admin office that has worked for inqaba biotec from its launch on in 2002, is Margaret. Those days, Margaret was employed as Cleaning Lady and part time. Some years ago, Margaret was given the chance to assist Melvin in the logistics department, did a great job there and moved to the admin office in 2014 as an administrative assistant. Nowadays, she focusses on archiving of delivery and purchase orders and on keeping the office in order. Margaret is grateful to the inqaba family for allowing her to personally grow and improve a lot, and she says that there are opportunities for everyone, if one is willing to learn. Margaret is mother of 3 grown up children and lives in Limpopo. Another long-time team member is Alta. She got to know inqaba biotec through her Pastel Software Dealership and Training Company. She has worked now for inqaba biotec for more than 10 years as well. Alta is inqaba biotec’s Finance Consultant; therefore her main task is to do all the accounting for inqaba biotec SA but also for our West- and East African subsidiaries. She likes that she has been here from the time inqaba biotec was much smaller and that she was able to see the growth. She enjoys the strong sense of team spirit here and the support from everyone. Alta likes drawing, music and creative writing. One of the two accounting assistants in the team is Lani. He joined inqaba biotec and the admin team 4 years ago as an intern. Today, as accounts assistant, his tasks include liaising with clients, ordering from suppliers and following up on payments. He is currently working towards his studies. Lani enjoys that he can work independently and he still gets important feedback from the team members. He likes to have a good relationship with the team and the clients. He enjoys reading, listening to music and trying out new things. The second accounting assistant is Tiyani, who he has joined the team in the beginning of the year 2014. His tasks are mainly the invoicing of clients, suppliers and every other thing that comes with being in the finance and administration department. He says about his team that they are one unit and everyone helps out everyone. He enjoys his tasks and likes that working times are flexible. Also Tiyani is studying besides his work; he studies at UNISA towards a Bachelor’s Degree in Accounting. Tiyani comes from Limpopo and he likes playing soccer and pool.